This afternoon I’m giving a talk at the 2014 Salish Sea Ecosystem Conference in which I present our estimates of sound pressure levels from commercial ships in Haro Strait, the core of the summertime critical habitat for the Southern Resident killer whales. I also take a first look at noise impacts of the current tanker and bulk carrier fleets and ask how those impacts may change if a suite of proposed fossil fuel export facilities are added to the Salish Sea. For this talk, I’m excited to have experimented with in-browser HTML5/CSS methods of presenting (alternatives to Power Point and Prezi). There are a bunch of interesting new players like SlideCaptain (good for equations), but I settled on Emaze because of how gracefully it handled embedding of sound and video. 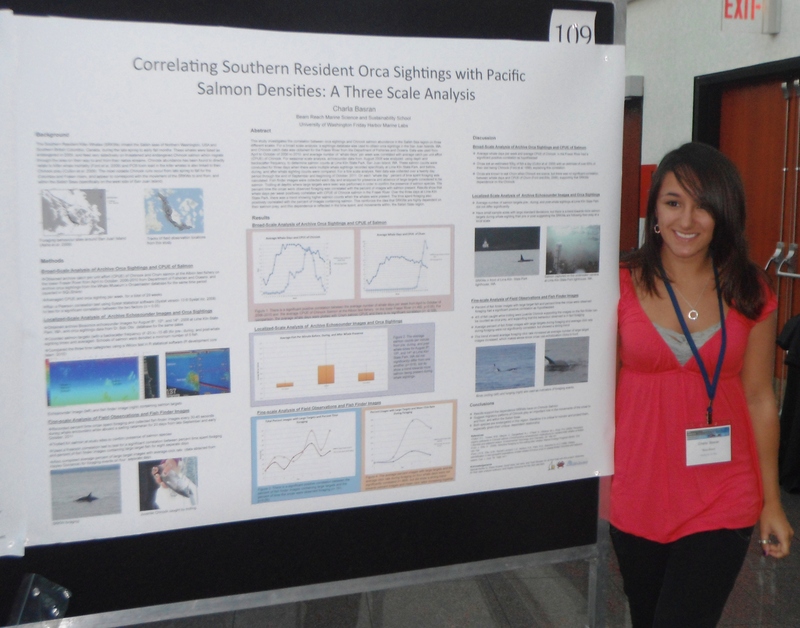 The whole Beam Reach crew was represented today in two killer whale sessions at the Salish Sea Ecosystem Conference. The sessions were convened by Scott and involved a great line-up of experts(see list of presenters below) talking about recent results from from non/invasive studies of southern resident killer whales (SRKWs). 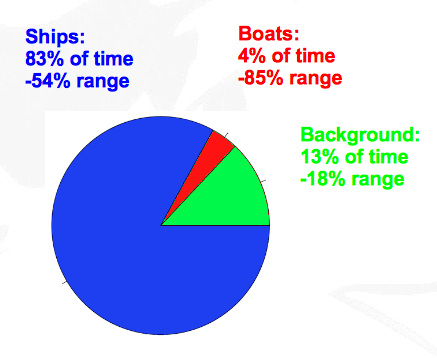 Val gave a talk on underwater noise in the SRKW critical habitat and estimated that ships dominate the noise budget 83% of time (see plot at right). This works out to a long-term average of nearly a ship per hour! Jason gave a talk on compensation in ship noise. 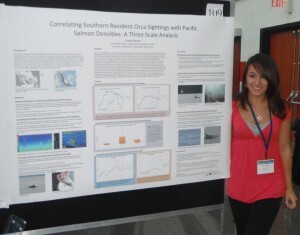 Andrea Buckman — one of our visiting experts this fall and last spring — spoke about the variable condition of chinook salmon. Robin, Laura, Sharon, Charla, and Hayley attended the sessions, and then continued to share and display their posters — now available on-line as PDFs — listed below. 110 – Hayley Dorrance: Can clicks tell us anything about the foraging behavior of SRKWs? The killer whales of the Salish Sea are listed as threatened or endangered in both the U.S. and Canada. As the scientific and stewardship communities continue to weigh the costs and benefits of invasive methods like satellite tagging, there is a pressing need to exchange all available information from non-invasive research techniques. There are also renewed efforts on both sides of the border to integrate the management of killer whales and the listed species, like Chinook salmon, upon which they prey. 2011 has also brought Federal regulation of orca-boat interactions in the U.S. This session will survey recent scientific results, with an emphasis on less-invasive techniques and new implications for transboundary killer whale management. Shipping noise and vocal compensation by Southern Resident Killer Whales: Do some ships have a larger impact? Saving salmon for endangered killer whales: A new paradigm in wildlife management? Thanks to the PRR Facilitator, Kirsten Hauge, for her help facilitating the sessions by keeping time for the speakers. And thanks to Larry Rutter of NOAA/NMFS for calmly reading his talk from his hard-copy notes because Scott had misplaced his presentation!